Renfrew’s environmental education programs raise awareness and encourage stewardship of our natural heritage. Preschool children explore the natural world at Renfrew using their senses and special tools provided by the instructor. Dance, storytelling, poetry and music are included. The instructor uses a finger puppet to add humor and interest. Two seasonal versions of this program are available, Fall and Spring. Underwriting support provided in part by Mary Ann Payne, in memory of Helen Herr Moyer. The nature center (Renfrew), school, and home are tied together in this full-year curriculum providing a comprehensive environmental learning experience for kindergarten children. Students visit Renfrew three times during the year (Fall, Winter and Spring). They meet the zany puppet character, Mother Nature, and her marvelous Wonder Trunk. Through seasonal activities using the five senses, the students train to become “certified EarthSeekers” learning to find nature’s wonders at Renfrew Park, in the school yard, and at home. Special tools, letters from Mother Nature, and a Wonder Box at school build anticipation for each classroom session. Parents play an important role too as they complete home-based outdoor activities with their child. Wake up Earth, it’s Spring! This program is for kindergarten students not enrolled in Earthseekers. Students discover a sparkly golden hat with a golden note that launches them on a walk to find signs of Spring. Along the trail students find several stations where they have opportunities for sensory exploration. At the end of their journey, they return to the hat which holds a surprise treat of raisins. There is also a golden note reinforcing the concept that the sun provides energy for planet Earth. Underwriting support provided in part by Rotary Club of Waynesboro; F&M Trust Company; and Sheetz, Inc.
A puppet from outer space needs help. First graders follow the stars to find the four needs of life which the puppet, Marvin, must learn. Through hands-on activities children explore living and non-living things and learn the importance of soil, water, air and sunlight. They earn four colored stars which are added to individual student necklaces. Each star represents one of the “needs of life.” The necklaces go home with the students to help them recall the details of their learning adventure. Underwriting support provided in part by John & Deb Beck. 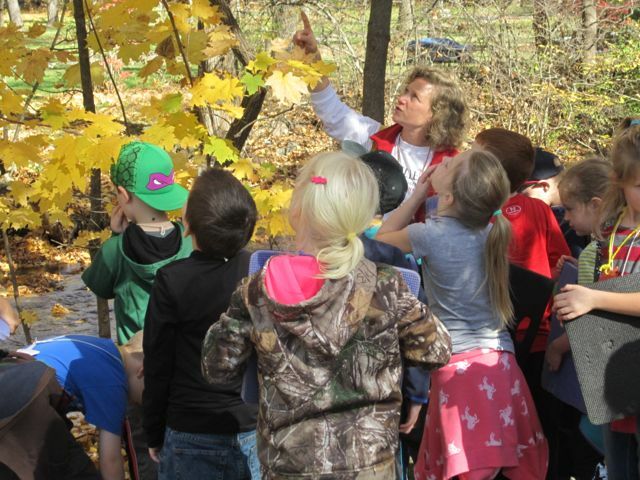 A nature walk in the Fall season designed for first grade students. Seasonal changes are studied: human, animal and plant preparation for winter; seeds and their methods of dispersal; solar cycles; secrets of fall leaf colors; sights, sounds, smells and touches of Fall. The book Chipmunk Song by Lynn Cherry is read, then students become “chipmunks” during a high-activity game which gets everyone (including adult chaperones) involved. Puppets and puzzles help students learn about the nine parts of nature: soil, water, air, sunlight, plants, animals, insects and other creepies, fungus, and me (humans). Basic concepts include energy flow (simplified photosynthesis), soil formation, water cycle, plant/animal air exchange, diversity, interrelationships, and importance of self. Underwriting support provided in part by the Bernie & Rosemarie Roberts Family, in memory of Harry D. Catts, Florence Gertrude & Richard G. McGowan, Sr., and Richard G. McGowan, Jr.; and Doris R. Large, in memory of J. Warren and Jessie O. Large. A spider puppet named Sydney has a problem. She has built a web and in order to make it complete she must find out how the nine parts of nature (see Earth Encounters) are interrelated. Students help Sydney by visiting four activity stations where they learn that plants and animals depend upon each other and upon non-living elements of nature for food, shelter, hiding places and transportation. Students earn a special necklace which they assemble at the end of the program (and take home) to help them remember the nine parts of nature. 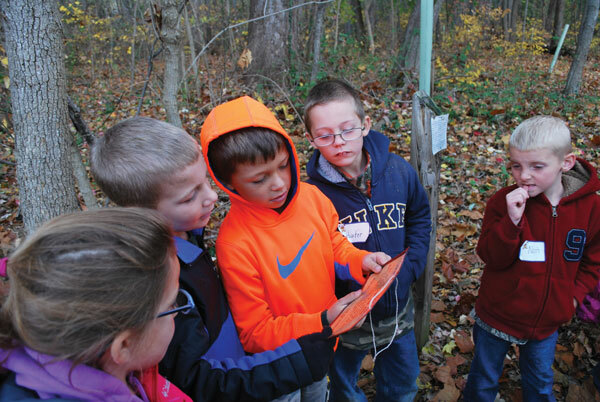 Third grade students embark on an adventure which immerses them in the natural environment of the park. The students are invited to become park rangers in order to help Head Ranger, Henry Hooter. They get training books and follow instructions left by the elusive Henry who is always one step ahead of them. The ranger recruits pursue their training mission which includes a review of the nine parts of nature (from the Earth Encounters program). The training culminates when the students set up their own micro parks to discover nature’s tiniest wonders. Underwriting support provided in part by Doris R. Large, in memory of J. Warren & Jessie O. Large. Students meet the “mayor” of Renfrew Park who invites each of them to take a job as a plant or animal within the natural community of the park. To move in to one of three available communities (field, forest, or marsh), organisms must consider all their needs. The ecological concepts of community and interrelationships are the focus, as upsets in the ecosystem stir up a chaotic reorganization in the three areas. The result is a court trial with “Judge Mopner” presiding and some amusing results through nutrient recycling. Underwriting support provided in part by Sandy Fisher, in memory of Harry Fisher; RBC Foundation. Students launch on a journey to four high-activity learning stations. Earning a large wooden lifesaver at each station, students gain important information about the geography, biology, and ecology of the Chesapeake Bay. They discover its relationship to themselves as watershed residents and ways they can help to preserve and protect the estuary and our local waterways. In the process, students see that the water quality in our local stream, the Antietam Creek, is directly related to the health of all water bodies downstream, including the Bay. Point and non-point sources of pollution are discussed. Upper elementary students define and explore the wetland communities of Renfrew Park. They learn the three major types of wetlands and examine the plants, animals, soils, energy flow and water chemistry of these special ecosystems. 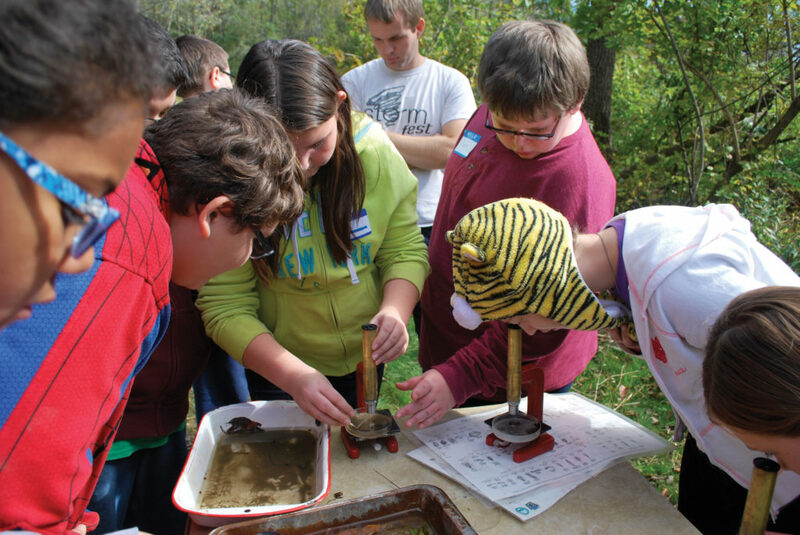 Hands-on activities involve soil sampling, water testing for pH, plant study, and macroinvertebrate investigation. Students use watershed models to see how wetlands act as sponges and filters. They learn why wetlands are valuable to humans ecologically, aesthetically, and economically. They discuss problems that threaten the survival and well-being of wetland ecosystems throughout the Chesapeake Bay region. Underwriting support provided in part by Patricia O’Connor, Melissa Graham Johns, in memory of Virginia Steck Graham; Waynesboro Lions Club; and Craig, Friedly, Potter and Moore Insurance. Earth Encounters students search for clues in the woods. 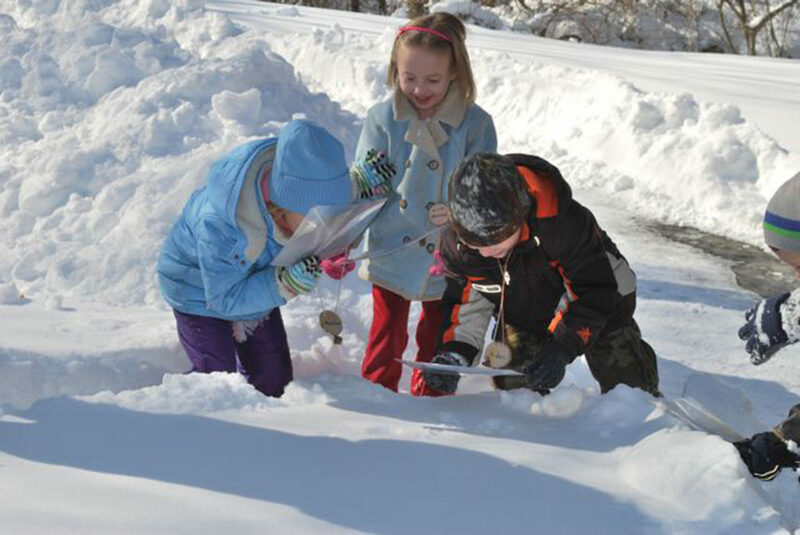 Kindergarteners use Fresnel lenses to magnify snow crystals during the Earthseekers program. Sixth-graders study macroinvertebrates during the Discovering Wetlands program. Learning about leaves changing colors in Fall Walk.